WHAT WILL IT TAKE TO POWER 23 MILLION HOMES WITH OFFSHORE WIND? | "Global Possibilities"
Home » Energy » WHAT WILL IT TAKE TO POWER 23 MILLION HOMES WITH OFFSHORE WIND? WHAT WILL IT TAKE TO POWER 23 MILLION HOMES WITH OFFSHORE WIND? The Obama administration unveils a strategy to exploit a vast but untapped source of renewable energy. For the first time, the United States government has outlined a strategy to tap an enormous source of renewable energy—offshore wind. How much? According to the report, titled The National Offshore Wind Strategy, as much as 86,000 megawatts of electricity could be generated by offshore wind by 2050—enough to power 23 million homes while reducing the country’s greenhouse gas emissions by 1.8 percent. It won’t be easy. The plan envisions rows of giant turbines anchored off nearly every U.S. coastline within 30 years. So far, only one offshore project has made the leap from planning to construction—the Deepwater Wind project off Rhode Island. Work has nearly wrapped up on the five-turbine, 30-megawatt, $300 million venture, and it is scheduled to go online in November. Only 11 areas off the Atlantic Coast, one off Ohio in Lake Erie, and one off the Pacific coast of Oregon have been leased for wind development. The Obama administration hopes that the ramp-up of untapped offshore wind power potential—which, if fully harnessed, could double the total electricity the U.S. generated last year—can benefit from the path worn by Europe. Across the Atlantic, Germany, the United Kingdom, Denmark, and other countries had installed more than 10,000 megawatts’ worth of offshore wind farm power by 2016, more than doubling the continent’s capacity in three years. Megawatts of offshore wind capacity. The U.S. has zero. Early projects, constructed some two decades ago, required large government subsidies to cover the high price of developing unproved offshore wind farms. Those early projects blazed a path for companies to scale construction and installation, allowing for the development of 100-plus turbine fields that can produce electricity at competitive rates. “Much of the cost-reduction progress seen in European markets can translate to the United States as developers leverage best-available European technologies and adapt them to the unique conditions of the United States,” the report reads. 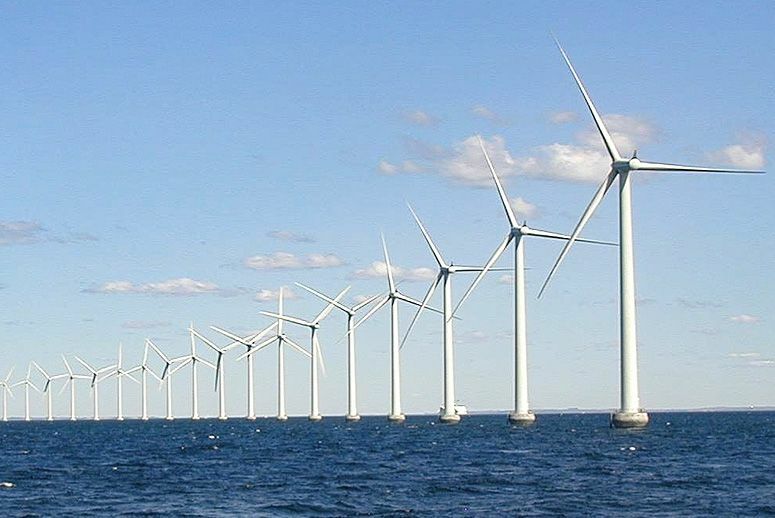 The offshore wind strategy was announced Sept. 10 in Massachusetts, on the heels of Gov. Charlie Baker’s signing a landmark energy bill ordering the state’s utilities to develop contracts with offshore wind farms to add 1,600 megawatts of power to the state’s grid. The National Wildlife Federation said the release of a coherent offshore strategy, and policy initiatives outlined in renewable energy plans in states such as Massachusetts, New York, and California, are opening the once-shut door of offshore wind. To jump-start offshore wind development, the Department of Energy and the Department of the Interior outlined three strategies: (1) improve wind turbine efficiency and technology and provide technical data on meteorological and sea floor conditions for ideal wind farm locations; (2) improve market conditions for investment in offshore wind, clarify how agencies regulate wind farms, and streamline the process; and (3) promote and clarify the benefits of offshore wind power and possible carbon emission reductions. One hurdle is to make offshore wind competitive with other sources of electricity, which is estimated at around $100 per megawatt-hour. A cost analysis by the National Renewable Energy Laboratory found cost reductions could reach below $100 per megawatt-hour by 2025 in some areas off the U.S. coast and elsewhere by 2030. The price of installing turbines increases with water depth. That means wind power prices should decline first along the shallow continental shelf of the northeast Atlantic Ocean before they do in the turbulent, deep waters off most of the Pacific coast. The current average price for offshore wind is $185 to $214 per megawatt; the price depends on wind quality, seafloor depth, and type of technology needed to install wind turbines, such as turbines fixed to the ocean floor (cheaper) or floating turbines anchored via cables (expensive). By 2030, the cost is projected to drop to a competitive $93 to $89 per megawatt. energy development as of August 2016. Such price drops have happened onshore. Between 2008 and 2014, costs for land-based wind energy in the U.S. decreased 40 percent as installations grew 17 percent annually.